- Manage events created on our website on the go! 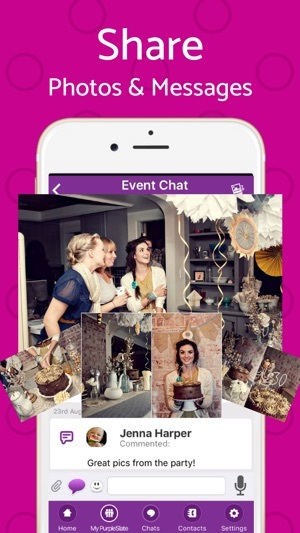 Create your own beautiful invitation using your personal photos or choose from a free photo library in our invitation app. 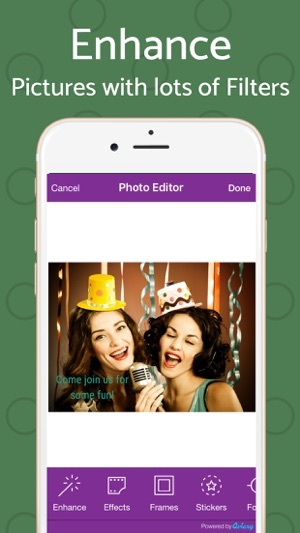 Use free photo filters in our app to give that extra personal touch! 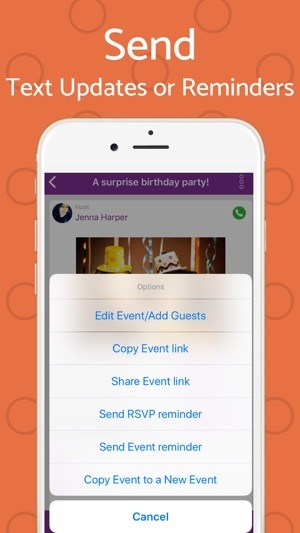 Fill in the party details, then choose your guests from your contact list. You can preview your invitation before sending to guests, too, and can even include a link to a registry, wish list or ticket purchase site. 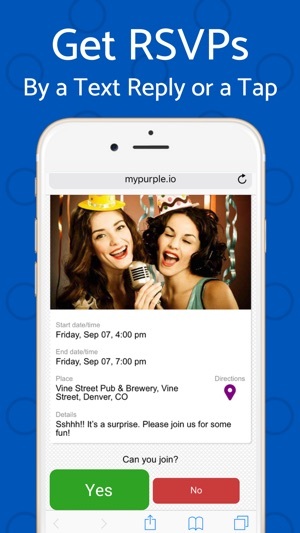 You can track RSVPs for any event or party with the PurpleSlate invitation maker in real time. 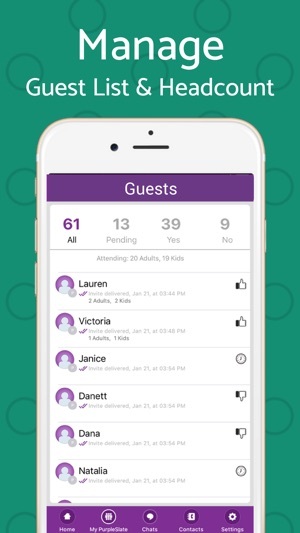 Your guests can add their headcount, and can even include the number of children and adults attending. Guests can get directions and add reminders to their calendar instantly - All without downloading an app or signing up for anything. 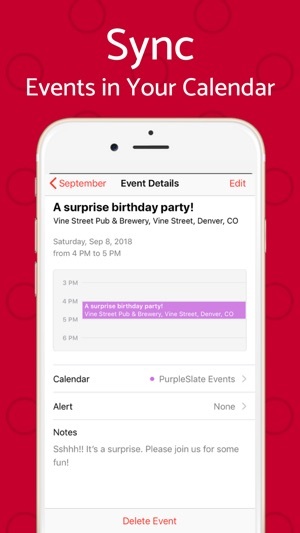 Hosts can send RSVP reminders for those who have yet to respond and can send event reminders to guests who have RSVPed ‘yes.’ PurpleSlate helps deliver accurate event attendance info for your party so you never have to buy extra food and drinks! You can also send instant updates if the weather changes your party plans so your guests know where to go. They can get directions right from the event’s web page. As a host you can chat privately with any of your guests. 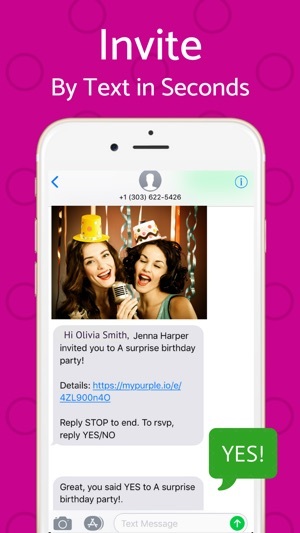 Your guests can also respond to you via text or using the event’s web link. You can also share media files like photos, video and audio in the app. - Get free text messages for just signing up and try it for free! Price may vary by location. Payment will be charged to your iTunes Account at confirmation of purchase. Life is better when we get together. 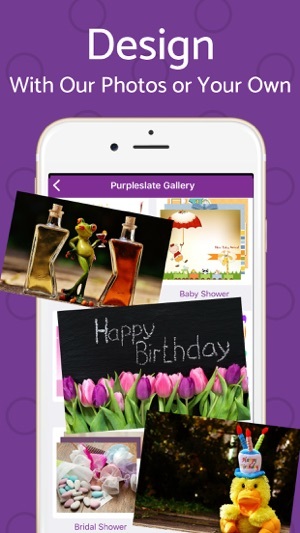 PurpleSlate makes it easy! We love feedback. Write to us at hi@mypurpleslate.com or in the app by going to Settings>Contact us. Okay, I would like too start off saying how great this app really is! I have had sooo much trouble with finding the best app for making invitations/ RSVPs for my friends and love ones. Other apps, wanted too charge me and felt like that was unnecessary. I’m pregnant, so instead of getting invitations printed out at a store, I wanted something that was really easy and accessible for me at all times. Not to mention, this app does not have a trial period! So, instead of you using this app, then have too pay for it like the others ones, this one is free and if you choose too plan another event any time in the long run, you could still do it without being penalized by having too pay! I would like to thank everyone who took the time too make this app possible for me! Great job! Thank you so much for taking the time to write about us. We are so glad to be able to make your event successful! Thank you for the lovely feedback. Sorry we did not see your comment sooner. We do not include the text "Can you join" in the event reminder text or page as it sent to guests who have already said yes. We do include that text in the RSVP reminder text as the RSVP for these guests are Pending. Could you please write to us at hi@mypurpleslate.com so we can look into the issue you faced with your guests. Thanks so much! This app always had problems with loading guest list or certain part of the event. It would either not load and you couldn’t see anything or load extremely slow. This was not a big issue so I tried to keep with it, then they started to charge for sending out event reminder or rsvp reminders, that’s when it went horrible. If I wanted to pay for something I definitely wouldn’t have downloaded this app, I would have went to one of the better ones. I stuck with it because it was decent and free. You can’t send message to people attending the event unless they have the app which I didn’t understand because the people who have the link are able to message you through the app without them having to download the app. We have worked on speed issues in the app and hopefully you are seeing an improvement already. If not, then please update your app version. We provided the app for free for as long as we could, without throwing a bunch of ads at our users to spoil their experience like other services. We hope to keep it that way, which is why we have added a very nominal and affordable pricing to help us mitigate our text messaging costs (which is not free). We hope you will find our service to be quite affordable and worth it to get the ease and speed of text invites.